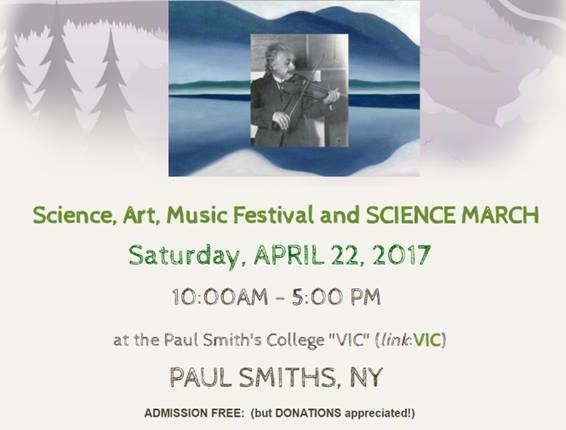 We will be kicking off this years 3rd annual SAMfest (Science Art and Music Festival) at Paul Smiths College VIC with our very own “March For Science”. The march will start at 10am, April 22nd. We will meet in the parking lot across the street from the campus entrance and march to the VIC. Please get there before 10am. There will be parking on campus, across the street from the main entrance, and at the VIC. Please dress appropriately it will be a walk in the woods in the Adirondacks in late April. Before the event we encourage you to make posters. It is important to keep in mind that this is a march for SCIENCE, we want to put forward a positive message with a strong showing to start off the day. In order for this to happen we need people. This is a reminder for you to spread the word until the event. It is happening Earth day April 22! Tell your friends, family, friends of your family, family of your friends, strangers, pets, other students, students from your local schools and anyone else you can possibly think of. This was Curt Stagers idea so drop that name if you have to get people to go.